For sale here is a classic double breasted gold button wool blazer in a Royal blue. A 42 short. length - 29.5. sleeve - 22.5. chest - 22. Size: Unknown, likely 44. Sleeve length, from shoulder: 23 (kinda short?). - center vent. Length, center back: 32. Vitale Barberis Canonico. Model: Lazio. Surgeon Cuffs. This is a great looking blazer in Excellent owned condition! The stitching on this blazer really stands out and gives it a sharper look. Very clean throughout with No issues. ITEM #6720. 60s Does 30s Belted Back Jacket. There is a light pink streak on the right low pocket. Length, center back: 35. Waist: 21. Chest, armpit to armpit: 23. Sleeve length, from shoulder: 29. Shoulder to shoulder: 19. See Photographs. Excellent Condition. Throat Latch Is Not Functional - No Button Underneath Other Side Of Collar. Button Down Pleated Flap Pockets. Accessories shown such as tie, shirt, pocket square, etc. are not included - for display only. The plaid is made up of cream, red, blue, and hints of green. The jacket is unconstructed with soft shoulders. Features wider lapels, 2-button cuffs, flap pockets at the hip, a pocket at the left breast, and a single back vent. ITEM # 6521. 60s Band Jacket. Marked sz 38 but fits more like size 36. Lightweight, feels like a tweedy woven polyester (not knit). Tiny picked hole on right front near the bottom, noticeable only on close inspection. Length, center back: 31. Waist: 20. Chest, armpit to armpit: 22. Excellent Condition! Check the measurements! No size tag in the jacket. ITEM #6732. 1910s-20s West Point Cadet Jacket. Unmarked but fits like size XXS Long. There are lots of moth holes on the front, armpits and sleeves. The collar and tail have dirty spots. There are mismatched buttons and yellowing in the lining. Add the silk shirt and platform shoes and you are styling. Breast button pockets, wide collar, single button cuffs. Length: on the back of the shirt, the bottom of the collar to the hem, laying flat. We are reasonable people. We do, however, reserve the right to make the final decision, in this regard. - 3 button front, 2 button cuffs, center vent. Shoulder: 19". Bust: 21". Sleeve Length: 25". Front Length: 26.5". Back Length: 25.5". Front Length: 31.5". Back Length: 32". Bust: 20". Fantastic high quality, great feel to the wool. Nice pattern. We believe that pictures speak louder than words and do our best to show several photographs of each item, including any flaws we find. Length (down the center of the back): 30". Chest (armpit to armpit across the front): approx 21". IT FEELS LIKE WOOL WITH SATIN LAPELS AND LINING, 46S"CHEST, 20"ACROSS SHOULDERS, 22"SLEEVES, 21"SHOULDER TO FRONT WAIST POINT, 40"BACK COLLAR TO TAILS BOTTOM. IT IS IN AS FOUND CONDITION AND WAS A RENTAL. 2 button closure. The feel is extraordinary. Handwoven, 100% virgin Scottish Wool. Size: Unknown, likely 42. - three button front. Lining on the inside front is a bit worn and split on the bottom edge; one of three left cuff button is missing. 1950s Lakeland Polka Dot Blazer. ITEM #6715. 100% top quality woven wool. The colors are browns and white. These have been in storage for over 40 years and are in great condition. 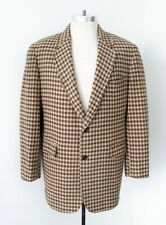 The jacket is green corduroy with a navy, red, and yellow glen plaid design. It is 100% corduroy cotton, has two front buttons, and has one rear vent. 1 Button-Up Front. Lining is 100% Polyester. Amazing 60-70s leather trim heavy paisley velvet smoking jacket from Cortefeil. There is a small tear that has been repaired to the back vent area inside and out, however there are no other flaws and this jacket looks incredible for its age. Vintage 70's Harris Tweed Henry Ballantyne Sports Jacket Blazer 38"
Henry Ballantyne. A lovely brown mixed colour tweed. Made in the 70's. Condition is average to poor, the lining is heavily worn with multiple splits see photos, the buttons need replacing as they don't match. Size xxs xs s m l xl xxl. Waist Girth 60 64 68 72 76 80 84. Bust Girth 80 84 88 92 96 100 104. Waist Girth 64 68 72 76 80 84 88. Arm Length (shoulder bone to the wrist) 52.5 54 55.5 57 58.5 60 61.5. Ankle Girth 20.6 21.4 22.2 23 23.8 24.6 25.4. ITEM # 5724. 60s Brass Button Band Jacket. Marked size 36 making this size SMALL. Top Collar to Bottom Hem-32". Shoulder to Wrist-25". 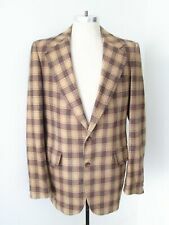 Great looking vintage men's casual wear checkered blazer. Spatz Industries. 1930's styling. Has a super nice vintage look with elastic waist band, gathered pockets and wide collar. Super nice condition with no stains, smells or repairs. Has a lining tear in one pit. Please review the photos carefully prior to purchasing. Local pick up always available!. Fabric is wool in a red, gray, and black plaid. Made by Levi's. Shoulders: 18". Length from shoulder: 29.5". Sleeve length from shoulder: 24.5". ITEM # 4683. 50s H Bar C Western Jacket. Material: Wool. Condition: Nice. Right shoulder has a small spot and the left shoulder has a tiny moth hole. Over all, still a nice jacket. If you are looking for a fun jacket to wear to a retro event or a formal event that is fun and different, then this is the perfect jacket for you. Double Breasted. 100% Wool (Most Tuxedo Jackets are 100% Wool, however this jacket does not have the material label so it could be a Wool Blend. ). Christian Dior Monsieur black airline pilot captain blazer jacket. 2 gold buttons, 4 stripes on sleeves. made in USA, union-made probably in the 70s. sleeves 23.5". shoulders 17". Hidden hood. 28" Length. 26” Sleeve. 19" Shoulder.